The chefs of Joule, Monsoon and Navy Strength swear by Red Boat fish sauce — it costs more, but it’s worth it. SEATTLE CHEF Jeffrey Vance found out about it “because of all the chefs around me talking about it.” He uses it in the uncommonly delicious Caesar salad at the restaurant Navy Strength, and “sneaks it into all sorts of sauces and dressings to add a little funk,” there, and at neighboring No Anchor. Eric Banh, who runs Monsoon, Monsoon Bellevue, Seven Beef and the various Ba Bars, visited the factory in person. His fiancée had to leave the premises because of the smell. “She said, ‘I’ll wait for you outside’ after 15 minutes!” he says, laughing. Now he orders 60 cases a month for his restaurants. 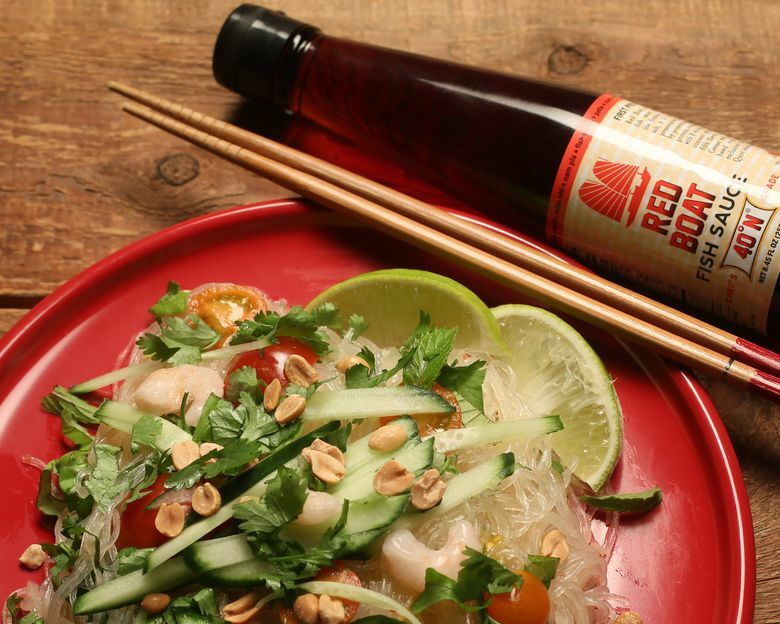 The chefs’ not-so-secret weapon is Red Boat brand fish sauce, made with particular care on the lovely tropical island of Phu Quoc, Vietnam. Fish sauce is the ingredient that gives certain dishes in the cuisines of Vietnam, Laos, Burma/Myanmar, Korea, Japan and beyond an ineffable savory, umami punch. As per Vance, it’s often described as funkiness. In its pure form — as in the way that Red Boat makes it — fish sauce is just fish, usually anchovies, plus salt, plus fermentation. In the case of Red Boat, it rests for more than a year. On its own, from the bottle, fish sauce smells pungent. Of the Red Boat factory, Banh says, “It was very clean, but damn, stinky and hot, for sure … Imagine there’s no AC, and the roof is metal, and there’s a concrete retaining wall. Because of the metal roof, it’s hot as hell, and it reeks.” He laughs. He describes the huge wooden barrels Red Boat uses to age the sauce as “probably 50 times bigger than a wine barrel.” The company has its own boat, he says: “They go to catch fish, and then they immediately salt these fish right away to retain the freshness.” Red Boat uses only wild-caught black anchovies. Pham grew up in Saigon, and upon coming to the States, he couldn’t find fish sauce with the rich flavor he remembered. He also recalled his uncles mentioning Phu Quoc as home to the best of the best. His quest ultimately led him to expand a small, family-owned factory there in 2006, and the rest is recent history. 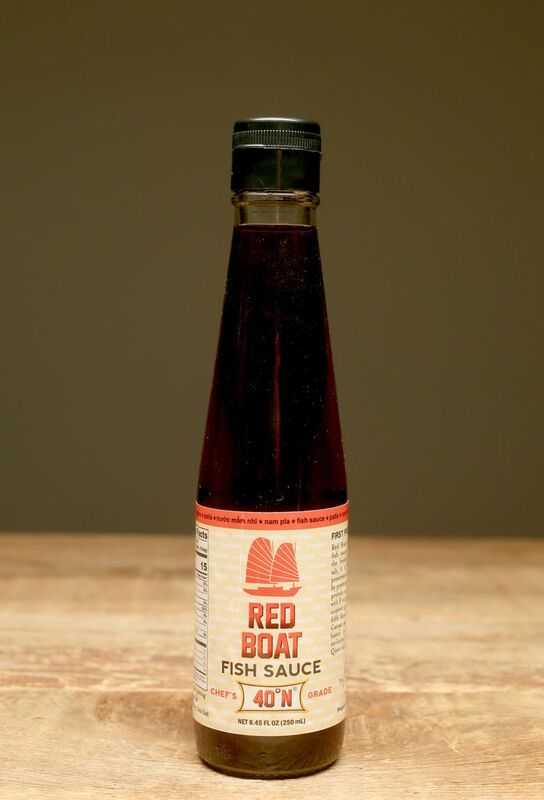 Red Boat won America’s Test Kitchen’s fish-sauce taste test. And Bon Appétit’s official Seal of Approval. Saveur loves it, too. If you get a chance to look at it next to another brand, appreciate the color: Where Three Crabs is a brighter, orangy amber, Red Boat glows a burnished reddish-brown. And it is the protein content that makes it richer. America’s Test Kitchen sent samples to a lab and found that Red Boat contained much more protein than the other common brands it tried — in some cases, triple the amount. And yes, you pay more: At Uwajimaya right now, a 17-ounce bottle of Red Boat goes for $8.99, while Three Crabs is $4.99. (Of course, at Whole Foods, you really pay more: The same bottle of Red Boat is $12.99 there. You also can find it at PCC, Central Co-op and online.) Is it worth it? The chefs think so, and they go through a lot more of it than the rest of us do. Of course, you can and should substitute the vegetables and fresh herbs here with any of your favorites, and adjust the spiciness level for your excitement/comfort (via increasing or reducing the serrano and/or chili flakes). Likewise, cubes of tofu or shredded cooked chicken could sub for the shrimp. You also could use firmer (but still nicely squiggly) rice vermicelli instead of the slippery wonders that are bean thread noodles (also called cellophane or glass noodles). I kept the vinaigrette super-simple so the flavor of the fish sauce shines through, and you’ll see that it’s weirdly compelling. Using scissors to approximate a rough chop for the fresh herbs is a good timesaver and also kind of fun. And if you have a mandoline with a julienne-ing attachment, it will make short work of the cucumber. This salad tastes just as good — or even better — the next day. 1. Whisk the first seven ingredients together in a small bowl. Add the shallot(s) and green onions to let them soak in the dressing. 2. Put the noodles in a large bowl, and add enough boiling water to cover. Mix them around a bit to separate, then let them stand until they’ve softened, according to package directions (or until very slippery-soft). Drain them, then rinse under cold water, stirring to cool them all down; drain well again. Use scissors to cut noodles several times (bean thread noodles come long). Put them back in the large bowl, and pour on the dressing; mix to coat. 3. Add the tomatoes and all the rest of the ingredients, except the peanuts and lime wedges, to the noodles; toss to mix and coat. 4. When serving, be sure to dredge up some veggies/shrimp/herbs, which tend to fall to the bottom, for each plate. Sprinkle with peanuts, and garnish with lime wedges (which you actually should squeeze over it before eating!). Greg Gilbert is a Times staff photographer.